Book of Mormon Wars (are over): June 2018 Ensign - Unity, but why is Church History Department misleading the Saints about Cumorah? This is a friendly discussion among brothers and sisters who all love the Book of Mormon and believe it is actual history. We seek unity on how to interpret the text and Church history. 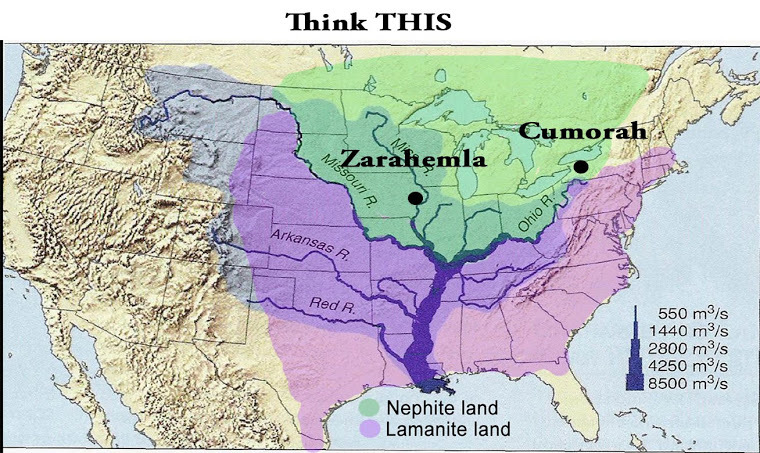 This blog focuses on the North American setting as the simplest and best explanation of Book of Mormon geography, with Cumorah in New York, but we recognize other settings are meaningful for other people. June 2018 Ensign - Unity, but why is Church History Department misleading the Saints about Cumorah? 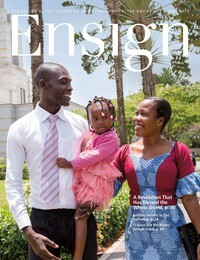 The June 2018 Ensign has a wonderful short article titled "United in Doing Good." It fits well with the "summer of love theme." The article includes excerpts from Lucy Mack Smith, History, 1845, and the Nauvoo Relief Society Minute Book, including Emma Smith's observation about "the necessity of being united among ourselves." The article notes that "President E. Smith … rose and said that measures to promote union in this society must be carefully attended to." The summer of love is an ideal time to contemplate unity. Church members seek complete unity and harmony as we minister to one another and to the world at large. But, as Emma also said, we need to "deal frankly with each other." And, frankly, there is an ongoing obstacle to unity in the Church, found right in this Ensign. It concerns the Book of Mormon, and the ongoing efforts by the Church History Department (CHD) to revise Church history to promote M2C. * CHD appears to be colluding with the efforts of BYU/CES to teach the Saints that the prophets are wrong about the New York Cumorah. This is part of a pattern of conduct, enforced by the Correlation Department, to censor references in Church history that contradict the prevailing M2C narrative. We've seen it in lesson manuals (e.g., here, where they edited the Wentworth letter), artwork, media, and visitors centers. Now we have the Ensign itself censoring a key reference to the hill Cumorah in New York. How can we achieve unity when employees at BYU/CES/COB are teaching the youth, and the world at large, that the prophets are wrong? The same June 2018 Ensign that contains Emma's comments about unity also contains a chapter from the new Church history book Saints that misleads the Saints about an important event in the life of Joseph Smith. 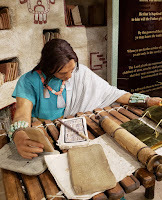 Much of what we discuss on this blog can be chalked up to ignorance about what the prophets have taught, which is understandable because LDS intellectuals have done everything possible to suppress Letter VII and the teachings of the prophets about the New York Cumorah. But today we're going to look at what appears to be a deliberate effort by the Church History Department to mislead members of the Church by (i) inaccurately paraphrasing an important account in Church history and (ii) omitting critical information from that account. NOTE: new readers who are not familiar with the M2C academic cycle that has caused this problem can read the background in the last section of this post. Now, we ask, how is the Church History Department misleading the Saints about Cumorah, and why are they doing it? One would think the Church History Department would be neutral on the topic of Book of Mormon geography, but the employees there are close colleagues of the M2C promoters at BYU/CES and they are doing what they can to enable their colleagues to promote M2C. I showed an example from the April Ensign, but the June Ensign is the most egregious (so far). To be sure, Saints is being written to appeal to a broad audience. It takes liberties with quotations and paraphrasing. But that's not an excuse to mislead the Saints by omitting important information merely because it contradicts M2C. This chapter, titled "Be Watchful," covers the events leading up to the time when Joseph obtained the plates. At one point, the chapter relates an account of Joseph being chastised. One day, Joseph went to town on an errand. Expecting him back for dinner, his parents were alarmed when he did not return. They waited for hours, unable to sleep. At last Joseph opened the door and threw himself into a chair, exhausted. “Why are you so late?” his father asked. “I have had the severest chastisement that I ever had in my life,” Joseph said. “Who has been taking you to task?” demanded his father. This is Lucy Mack Smith's history from 1844-5. If you go to the link, you'll see that the quoted section is lined out. You wonder, why would the Church History Department misquote and cite a source that was lined out in the original? What makes this inexcusable is that Lucy revised this particular section. That's why it is lined out here. But the Church History Department avoids the revision because it refutes M2C. Notice, the passage quoted in Saints was lined out because Lucy revised it in the 1845 version. The Church History Department is not unaware of the 1845 version. In fact, the article titled "United in Doing Good" about Emma Smith (the one we looked at in the first part of this post) cites the 1845 version. Naturally, you wonder, why doesn't the Church History Department cite the revised version, the one in which Lucy corrected the early draft? Notice how Lucy revised the lined out passage. She provides more details and instead of having Moroni tell Joseph he is "negligent," she quotes Joseph as saying the angel told him he "had not been engaged enough in the work of the Lord." Significantly, she also quotes him saying this happened "as I passed by the hill of Cumorah, where the plates are." The basic premise for M2C is that the "hill in New York" was not really Cumorah. Instead, the M2C intellectuals claim, the hill in New York was mistakenly labeled Cumorah by early Saints, and Joseph passively adopted this false tradition, thereby misleading the Saints. All the prophets who have affirmed the New York Cumorah were also wrong, according to these intellectuals. But here, Lucy recalled that Joseph referred to Cumorah, by name, before he even obtained the plates. He could only have learned this from Moroni. mentioned, quoted or cited in Saints. Presently he smiled, and said in a very calm tone, “I have taken the severest chastisement, that I have ever had in my life”. This statement about Cumorah completely supports the teachings of the prophets and refutes the teachings of the M2C intellectuals. Pause a moment and realize what a difference it would make if the Church History Department was honest and accurate. The book Saints would include the statement from Lucy's revised history. Everyone in the Church (as well as investigators) would learn that Joseph learned the name Cumorah before he even obtained the plates. The translation was yet in the future. Joseph could only have learned the name of the hill from Moroni. Obviously, if that was the case, then the hill in New York is actually Cumorah, as the prophets have consistently and persistently taught. But the Church History Department doesn't want members of the Church to even know about this, so instead they cite (and quote) a rough draft that was lined out and replaced with a more detailed and corrected version of the account. This may appear to be nit-picking, but I think this is a serious problem. The employees in the Church History Department know full well how significant Lucy's revised history is. They know that their colleagues at BYU/CES/COB, especially the Correlation Department, are insisting that Cumorah cannot be in New York. That's why we have the M2C display in the Visitors Center on Temple Square. But they also know that Lucy's revised statement completely contradicts M2C. They don't want members of the Church to even know about it. Even people fairly familiar with Church history would have passed this by unawares. The millions of Church members around the world, in all languages, plus future generations, have no hope of learning the truth when the Church History Department is deliberately suppressing and changing Church history this way. BTW, the same M2C intellectuals who cite Lucy's account for other details--Lucy is the sole source for many important events in early Church history--insist she was wrong about this. She had a poor memory, they say, or she conflated this account with another account. Those of us who accept Lucy's account point to two important indicia of credibility and reliability. First, the earlier draft was lined out and replaced with more detail. Lucy directed the revisions, an indication that when she read the first draft, she realized it was not completely accurate. For example, the first account has the angel telling Joseph he was "negligent," but the revised account has the angel telling Joseph he "had not been engaged enough in the work of the Lord." Which sounds more like the words of Moroni? Second, Lucy's account of Joseph learning the name Cumorah from Moroni has corroboration in other historical accounts. For example, the Autobiography of Parley P. Pratt, a source cited in Saints (note 4 to Chapter 4), includes this quotation from Oliver Cowdery's teachings to the Lamanites in Kansas: "This Book, which contained these things, was hid in the earth by Moroni, in a hill called by him, Cumorah, which hill is now in the State of New York, near the village of Palmyra, in Ontario county." p. 57. It's possible Lucy knew what Oliver was teaching, but she didn't get it from Pratt's autobiography because it was not published until many years after this 1845 version of Lucy's account was written. Plus, of course, the revised account supports the teachings of the prophets about Cumorah in New York. The M2C intellectuals (and their followers at BYU/CES.COB) dislike the revised account is because it contradicts their M2C theory. For what other reason would the Church History Department cite the rough draft instead, even quoting material that had been lined out? Anyone who doesn't think M2C intellectuals are a problem needs to take another look at what's going on in the Church History Department. The M2C ideology has been inserted throughout the commentary to the Joseph Smith Papers. If this continues, future generations will have no chance to learn the actual history and what the prophets have taught. Except the critics of the Church will point it out and use the revisionist Church history as a weapon to undermine faith. I think it would be far better to report the truth in the first place. 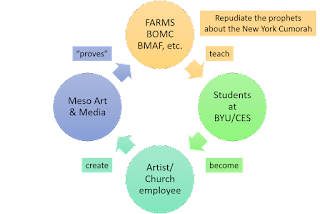 Of course, I also think it would be better to sustain the teachings of the prophets about the New York Cumorah, but the exact opposite is going on at BYU/CES/COB. Background on the M2C Academic Cycle. LeGrand Richards, Marion G. Romney, Mark E. Petersen, etc. Instead, according to these intellectuals, the "real" Hill Cumorah (Mormon 6:6) is somewhere in southern Mexico. They call this the Mesoamerican/two-Cumorahs theory, the idea being that the "hill in New York" is merely the place where Joseph obtained the plates and not the hill referred to in Mormon 6:6. This directly repudiates the teachings of the Church leaders listed above. These intellectuals have been teaching at BYU and CES for decades now. They have trained thousands of students to accept M2C, including most of the employees in the Church Office Building, the Church History Department, etc. As a result, for the last few decades, we have had a steady diet of M2C in art, media, lessons, and even visitors centers. M2C is explictly on display at the North Visitors Center on Temple Square, as I've pointed out several times. The exhibit actually portrays Mormon abridging the Nephite records from a Mayan codex! Meanwhile, Moroni is off in the distance in upstate New York, burying the plates (along with the sword of Laban and the Liahona, which contradicts all the historical accounts but is shown this way to promote M2C and to repudiate what Oliver Cowdery told Brigham Young and other Church leaders). Theoretically, all of this could be attributed to a policy of "neutrality" about Book of Mormon geography, but we can all see there is nothing neutral about it. 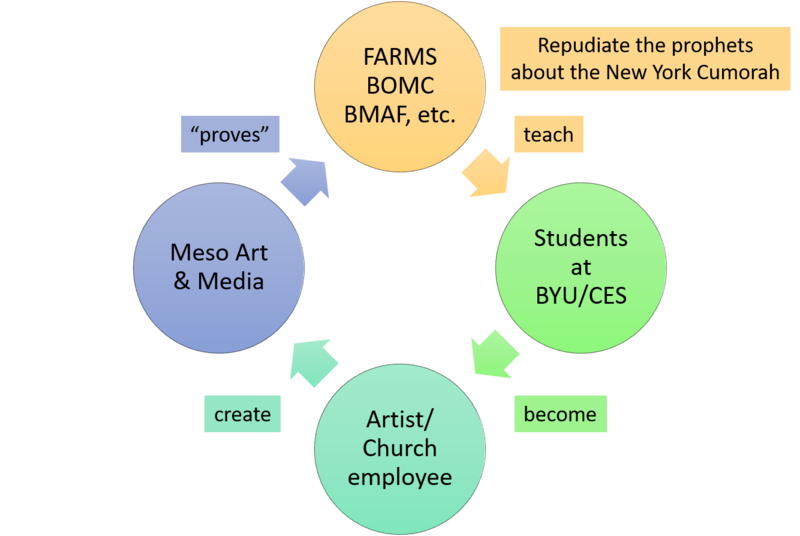 BYU/CES/COB have been steadfastly promoting M2C for decades, with no thought of even informing Church members what the prophets have actually taught, let alone portraying those teachings in artwork, media, visitors centers, etc. *M2C is the acronym for the Mesoamerican/two-Cumorahs theory.